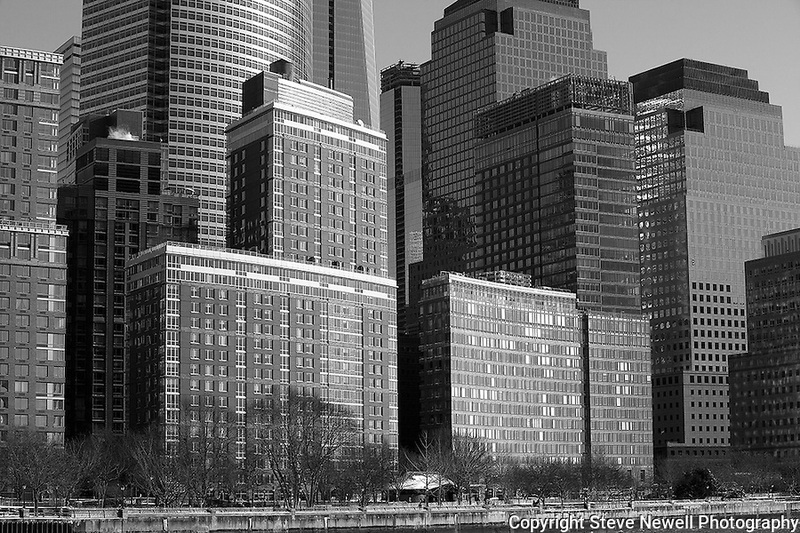 "Downtown" Black and White Downtown Manhattan New York. The New World Trade Center Tower is the wide skyscraper in the left -middle of the photograph. I shot this Downtown Manhattan Skyline scene while on a boat tour in the days before the worst storm in 20 years blew in lasting three days. The strong winds made it difficult to stay warm, hold my camera stable on my monopod and stay out of the water spray from the waves created by the boat. The New World Trade Center tower was just finishing construction at the top and rises high above the other skyscrapers. During the storm Governors in surrounding states and New York banned driving personal vehicles on the public highways for a couple days. Being from Lake Tahoe I came prepared for the weather and was excited to capture New York City and Central Park with fresh snow. The incredible skyline of Manhattan was breathtaking. Growing up in California, visiting San Francisco as an adult regularly and shooting it many times as a professional photographer didn't prepare me for the magnitude of the impressive size and quantity of the buildings and skyscrapers that form the skyline of Manhattan. My hat is off to the Architects and Engineers who contributed to building the touted greatest city on Earth. Black and white photography is still my favorite so you will see many images offered in Color and BW.